Please Note: If you are using Chrome as your web browser and would like to subscribe to this page as an RSS feed you will have to download the following extension for Chrome - RSS Subscription Extension (by Google). Or, you can right click on the orange RSS button, select Copy Link Address, and paste the link address in the Reader of your choice. It’s one of the sweetest days of the year – whether it’s due to chocolates, flowers, or sentimental words – but for dozens of couples in Franklin County, they got a lot more this Valentine’s Day. A unique challenge between two Ohio courts is getting competitive, judging from the mounting cereal boxes raised by Barberton and Stow courts this week. The Ohio Women’s Bar Foundation (OWBF) will be granting a scholarship in the amount of $2,500 to one law student for the 2019-20 school year. The deadline for submission is Friday, April 5, 2019, and the scholarship will be presented to the recipient at the Ohio Women’s Bar Association and Ohio Women’s Bar Foundation’s Annual Meeting & Conference on May 3, 2019 at the Nationwide Hotel & Conference Center, Lewis Center, Ohio. The OWBF and the OWBA work closely together. Formed in 2008, the Ohio Women’s Bar Foundation mission is to research, analyze, compile, publish and distribute educational materials to enable women attorneys and those interested in encouraging women attorneys to become more proficient in their profession with the assistance of their local and national woman's bar associations. The OWBF is a nonprofit organization under IRC section 501(c)(3). Fostering communication and networking among women attorneys. Promoting and advancing professional opportunities for women attorneys. Promoting the appointment and selection of women to various federal, state and local positions of influence. Promoting and providing continuing legal education targeting areas of particular interest to women attorneys. Monitoring and supporting government legislation, policies, and practices affecting women. Serving as a statewide resource representing perspectives of women in the legal profession. If you are a law student and would like to apply for this scholarship, please fill out the scholarship application. The Ohio Board of Professional Conduct has issued an advisory opinion concerning the representation of current or former clients in unrelated matters when the clients are directly opposed. CLEVELAND, OH – Reminger Co., LPA is pleased to announce the appointment of several new chairs and co-chairs for select practice groups. Kevin joins Jim Turek in co-chairing our nationally recognized trucking and transportation practice group. Kevin works out of the Columbus office, and serves on our catastrophic response team that provides on-call support to clients in the transportation and manufacturing industries. Kevin frequently lectures to insurance carriers and companies regarding litigation, trial preparation and the management of catastrophic losses. He is an Adjunct Professor in Trial Advocacy at Capital University Law School and is a member of the Ohio Supreme Court Lawyer to Lawyer Mentoring Program. He is a member of many professional organizations, including the Transportation Lawyers Association, the Trucking Industry Defense Association, Defense Research Institute, as well as local and state bar associations. Prior to joining Reminger, Kevin served as staff attorney to Ohio Supreme Court Justice Herbert Brown. Kevin is rated “AV® Preeminent™: Very Highly Rated in Both Legal Ability and Ethical Standards” by Martindale Hubbell Peer Review. Kevin can be reached by calling 614.232.2416 or by emailing kfoley@reminger.com. Adam M. Fried and Franklin C. Malemud have assumed co-chair roles for Reminger’s probate and trust litigation group. Adam is based out of Reminger’s Cleveland office, where he focuses his practice on matters involving estate, trust, probate and guardianship controversies. Adam was selected as the 2015 and 2018 Best Lawyers “Lawyer of the Year” in Cleveland for litigating trusts and estates and as the 2019 Best Lawyers “Lawyer of the Year” in Cleveland for elder law. He has been honored as a Super Lawyer since 2012, as a Top 100 attorney in Ohio, and a Top 50 attorney in Cleveland by Ohio Super Lawyers Magazine. Adam is rated “AV® Preeminent™: Very Highly Rated in Both Legal Ability and Ethical Standards” by Martindale Hubbell Peer Review. Adam was elected Fellow to the American College of Trust and Estate Counsel and has authored and lectured nationally on issues pertaining to client decision making, legal capacity, the exercise of undue influence and financial exploitation of the elderly. He also has taught a wills, trust and estate course at the Cleveland-Marshall College of Law. Adam previously served as chairperson for the Consortium Against Adult Abuse, a five-county taskforce charged with developing plans, strategies, and education to help the community prevent against abuse, financial exploitation and neglect of the elderly. By appointment of the Cuyahoga County Probate Court, he also previously served on the steering committee established to create an ITeam consisting of multiple professional disciplines whose role is to troubleshoot complicated cases relating to the plight of at-risk seniors. He is a Past President of the William K. Thomas Chapter of the American Inns of Court and is also a member of the Ohio State Bar Association Estate Planning Trust and Probate Section Council where he is actively involved in legislative efforts relevant to the law of probate, estates, trusts, and guardianships. Adam can be reached by calling 216.430.2193 or by emailing afried@reminger.com. Based out of Reminger’s Cleveland office, Franklin focuses his practice upon our firm’s unique probate court and trust litigation group which deals primarily with litigation involving wills, trusts, guardianship, conservatorship, powers of attorney, and living wills. In addition, Franklin defends professional liability litigation with a focus upon lawyer negligence. Franklin serves on the Jewish Community Federation's (JCF) Professional Advisory Council steering committee, which assists JCF members with continuing education on charitable gift planning. Franklin is a fellow of both the Ohio State Bar Foundation and Cleveland Metropolitan Bar Foundation. He has also served as Chair of the Cleveland Metropolitan Bar Association’s Estate Planning, Probate and Trust Law Section. Franklin has been listed in Best Lawyers for both “Litigation-Trusts and Estates” and “Trusts and Estates.” Franklin has also been recognized as a Super Lawyer by Ohio Super Lawyers Magazine since 2016. Franklin can be reached by calling 216.430.2225 or by emailing fmalemud@reminger.com. Based in Cleveland, Allison focuses her practice on elder and special needs law, including estate and long-term care planning, estate and trust administration, probate and guardianships. In addition to the Estate and Trust Administration practice group, Allison also serves as the Chair of Reminger's Elder Law and Special Needs Planning practice group. Allison has published articles and is a frequent speaker in the areas of probate, estate planning, government benefits, and special needs trusts. Her audiences include individuals, bar associations, non-profit organizations, and other professional organizations. Allison is an Accredited Attorney with the U.S. Department of Veterans Affairs. She is a member of the National Academy of Elder Law Attorneys National and Ohio Chapters and the Ohio State Bar Association's Estate, Trust & Probate Law Section, and Elder & Special Needs Law Committee. Allison is currently serving as Secretary of the Cleveland Metropolitan Bar Association’s Estate Planning, Probate & Trust Law Section. In addition, Allison serves as a member of Julie Billiart Schools’ Advancement Committee, the Alzheimer’s Association Cleveland Area Chapter Walk to End Alzheimer’s Sponsorship Committee, Hospice of the Western Reserve's Advisory Committee, the Board of Directors of Milestones Autism Resources, and the Board of Directors of Ohio Living Breckenridge Village. Allison has been recognized as a Rising Star by Ohio Super Lawyers Magazine and was honored with a “Forty Under Forty” award by Crain’s Cleveland Business in 2016. Allison can be reached by calling 216.430.2105 or by emailing amcmeechan@reminger.com. Russ has been based in Reminger’s Cleveland office for the past 30 years and has served in management roles for various practice areas within the probate realm. Russ is frequently called on to handle disputes between next-of-kin, beneficiaries, guardians, and executors. These disputes include, but are not limited to, will contests, declaratory judgments to invalidate a trust agreement or amendment, joint with rights of survivor or payable on death disputes, transfer on death beneficiary disputes, guardianship appointments or terminations, fraudulent uses of powers of attorney, and any and all cases regarding a probate or non-probate financial misuse regarding a decedent or elder clients. He has been invited to speak on behalf of many organizations on issues that range from probate administration to undue influence and incompetency claims to guardianships and guardianship litigation. Those groups include the Ohio State Bar Association, the Cleveland Metropolitan Bar Association, the Lake County Bar Association, National Business Institute, Sterling Institute, Cleveland Marshall College of Law, and numerous other entities. Russ has also served as an assistant prosecutor for the cities of Willowick, Willoughby Hills, and the Village of Waite Hill. He currently serves as a prosecutor for Lake Metroparks and has done so since 2000. His experience as a magistrate and law clerk for the Lake County Probate Court in the early 1980's provided invaluable experience to him as to how probate courts analyze cases in the areas of probate and elder law. Russ has been recognized as a Super Lawyer by Ohio Super Lawyers Magazine since 2014, listed in Best Lawyers in America for Litigation-Trusts and Estates, since 2012, and is rated “AV® Preeminent™: Very Highly Rated in Both Legal Ability and Ethical Standards” by Martindale Hubbell Peer Review. Russ is very dedicated to the fight against opioid abuse as a Board member of The K.I.S.S. Foundation and President of Fight the Urge, Inc., as well as an active speaker on the topic. Russ can be reached by calling 216.430.2157 or by emailing rmeraglio@reminger.com. Carrie is based out of Reminger’s Cincinnati office, and joins Gregory Guice in co-chairing the Retail, Hospitality, and Entertainment Facilities practice group. In addition to her experience with retail and hospitality liability, Carrie also handles matters in the areas of general liability, medical and non-medical professional liability, insurance coverage and employment law. Since joining Reminger in 2008, Carrie has litigated cases in state and federal court, and has briefed and argued cases on appeal in Ohio, Kentucky and the Sixth Circuit Court of Appeals. In addition, Carrie has defended professionals and financial institutions in administrative proceedings in Ohio and Kentucky. Carrie is very involved with the Chase College of Law, currently serving as an Adjunct Professor, volunteering for the Chase Alumni Council and previously having coached the school's Trial Advocacy Team. In addition, Carrie is a former member of the Board of Trustees of the Ohio Women's Bar Association and the Supreme Court Judicial Ratings Committee. Carrie has been recognized as a Rising Star by Ohio Super Lawyers Magazine since 2017. Carrie can be reached by calling 513.455.4033 or by emailing cstarts@reminger.com. Holly is based in our Cleveland office and heads this new subgroup of our Governmental/Public Entity Liability practice group. Holly is a litigator and uses her analytical and advocacy skills to resolve legal problems for her clients, from counseling to conflict resolution to litigation and beyond. As a former teacher, Holly is familiar with the unique legal challenges facing educators and regularly defends boards of education, faculty, colleges and nonprofits against claims in both state and federal courts against alleged civil rights violations, excessive force, IDEA and ADA violations as well as claims of negligence, premises liability and EPL claims arising in educational settings. As an Ohio State Bar Association Certified Appellate Law Specialist, Holly has a strong advocacy background and has been instrumental in the prosecution of appeals in state and federal appellate courts across the country. Holly is a member of various professional bar and trial lawyer associations and regularly publishes articles and gives presentations throughout the country on issues that impact her public and private education clients. Holly has been recognized as a Rising Star by Ohio Super Lawyers Magazine. She has been rated “AV® Preeminent™: Very Highly Rated in Both Legal Ability and Ethical Standards” by Martindale Hubbell Peer Review. Holly can be reached by calling 216.430.2238 or by emailing hwilson@reminger.com. An internationally known lecturer on education, Dr. Frederic Bertley, will be featured at the Ohio Supreme Court’s annual Black History Month event Monday, Feb. 25 at 1 p.m. The Ohio Board of Professional Conduct today announced the filing of seven disciplinary case reports with the Ohio Supreme Court. Each report recommends discipline for an attorney charged with professional misconduct. 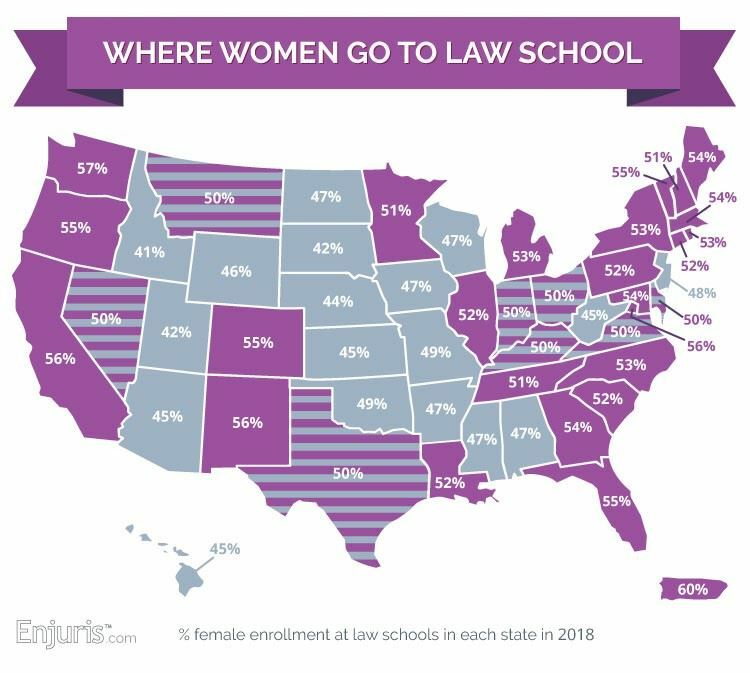 Here at Enjuris, we keep an eye on the status of women enrolling in law schools because we think the shortage of female personal injury lawyers matters. You can view the full report and more graphics here: https://www.enjuris.com/students/law-school-female-enrollment-2018.html. We think you’ll agree it’s a significant achievement that women have caught up in terms of law school enrollment — for the third year in a row. Help us support the next generation of female lawyers by keeping this important topic in front of those who can make a difference. You may repost any graphics or information in your work, citing Enjuris as the source. The Ohio Board of Professional Conduct has issued its 2018 annual report, highlighting the disposition of 83 disciplinary cases, a 30 percent reduction in pending caseload, and continued education and outreach efforts. Every now and then, a tour group comes to the Thomas J. Moyer Ohio Judicial Center whose work also serves the public. Rarely are such visitors as connected with the building as the most recent herd.